Penelope is now an official "cruiser." She had an epiphany while learning to walk with her little push car! Not only does she laugh now, but we caught on tape (tape?) her first steps! Ann entices her with some teething tablets and.... Tada! It's all about the motivation, and for Pepe the motivation is drugs. It could be worse, it could be raining. 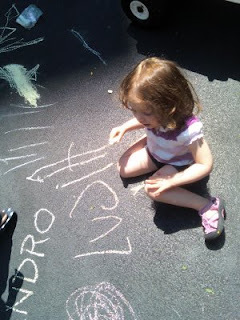 Lucia can write her name! In the end that's what this blog is for, isn't it?